SBI recently launched a unique credit card exclusively for the Doctors (Medical Professionals). Although the card serves a very unique proposition, but this is not the industry first. 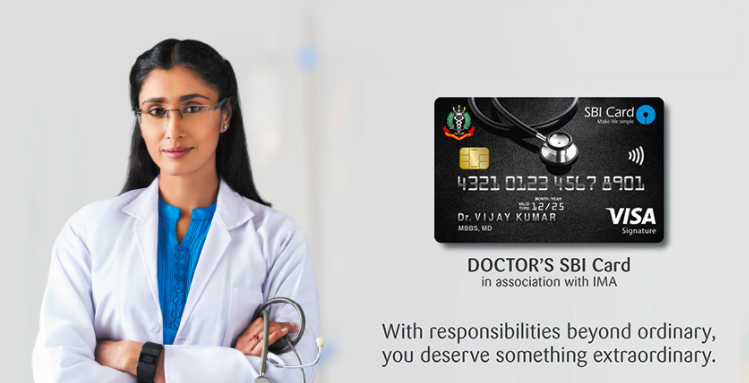 This same kind of concept exists for HDFC Bank’s Credit Card which has the Doctor’s Superia Credit Card (and Doctor’s Regalia) in it’s arsenal. However, this product from SBI is far above the HDFC Superia in terms of facilities and benefits. Let’s have a closer look at what this card has to offer. Welcome e-Gift Voucher: Rs 1500 from Yatra. E-Gift Voucher from Yatra.com/Bata/Shoppers Stop worth Rs 5,000 on achieving annual spends of Rs 5 Lakhs. Also, as mentioned above, the annual fees of Rs 1499 + GST is also reversed if you spend over Rs 2 Lakh in a year. Professional Indemnity Insurance of Rs 10 Lakh. Litigations are very common in Medical Profession and almost all medical practitioners have an indemnity insurance. This card gives a coverage of Rs 10 Lakh without any premium. This is unique and is given by no other card in the country as of now. 0% Sum Insured will be deductible. This effectively means, there is no premium to be to deposited for the cover of this policy. Just by keeping and using this card, you are very much insured. Emergency Card replacement Fees, when Abroad- NIL (Yes!, You read that right. At least that is what is written on SBI Website as of writing this post). Usually, it is the VISA/Mastercard that replaces the card on an emergency basis while you are travelling abroad and somehow have lost the card or if have been forced to block the card. The fees is said to be actuals subject to a minimum fee of $175. However, here SBI has said that the fees for this emergency replacement, while abroad is NIL. However, I’ll take this with a pinch of salt and it needs to be confirmed with SBI directly. These two propositions, place this card very high among the choices of a good international travel card. This card has been launched in association with the esteemed Indian Medical Association (IMA) and is the only card in India to be so. IMA is the only representative voluntary organisation of Doctors of Modern Scientific System of Medicine. Amidst crisis situation in India where the patient and the doctor trust is deteriorating day by day and incidence of violence against doctors at work place, by aggrieved relatives is on the rise, it’s a welcome move by IMA. I am sure, many readers of this forum who are medical practitioners will appreciate the move and would love to own this card. The card also embosses your professional qualifications and the salutation giving a a little privileged and unique feel. Not that this is a big move but it doesn’t hurt either. Do let us know how many of you medical professionals are willing to go for this card. We would be also happy to hear from other readers whether they think doctors should go for this card or better stick with other good cards from SBI like SBI Prime Card. Indeed a unique and feature rich card awarding the life saving professionals. Its always great to see new contents from you Siddharth. Please keep it up. I have off the topic question . I have Regalia First with Rs. 2.25 lakhs limit. I want to start with any credit card of yes bank so that I can upgrade it to preferred in future. My ITR is Rs. 4,01,000 . 1.Which yes card should I start with ? 2.Can I apply it with card on card basis ? 3. How much limit can I expect ? You might get Yesbank Prosperity edge card on card on card basis. Indemnity cover is good. Infact is a great move by IMA. But im disappointed with the earning potential of this card. Once i saw the Black colour of the card i got too excited that it would be brtter than SBI Elite card, only to be disappointed at the end. If they have launched this card atleast at par with SBI prime card, i would have definitely gone for it. They should have atleast provided 2 points per 100 and 10 points per 100 for medical equipments n Travel. But this seems to be a good move by SBI to identify the Medical professionals and target them with customised offers. I recently heard from a bank manager that the repayment track of doctors overall is almost 100%. That must be one of the factors behindlauching this card. Agreed. SBI Prime is a better card no doubt but the indemnity cover for Medical Professionals, specially Clinicians would matter a lot. But the Premium looks of the card and the Dr salutation along with the degree embossing always entices me to go for this card. The 2L threshold for annual fee waiver makes this card almost free of cost. Its definitely a good card for Beginners. Most of my friends who have gone for Simply click n simply save variants will be very much attracted to this card though. Woth Elite card having been devalued, i was looking to downgrade to Prime card. But the BookMyShow movie tickets nearly made-up for the 5000 annual fee.I hope SBI launches another variant of the card with good reward rate and hopefully something better than SBI Elite. I seriously doubt. But never say never with SBI. They might very well launch another card as per Sid. So, let’s keep a close watch. Is IMA membership compulsory for this card ? Most doctors are not members of IMA. For IMA members Professional Indemnity Insurance is inbuilt within their membership and do not require additional Indemnity. Hence 10 L SBI card Indemnity is not much value. Also, the low reward rate is disheartening. Most of the medical instruments & equipments are costly almost above 4-5 lakhs & hence could not be purchased with the low credit limit provided by SBI card. I have a SimplySave SBI CC with limit of 1.8 L & happy with it. No. They haven’t mentioned anywhere that membership is compulsory. This is I guess open to all doctors. Sorry to say, but indemnity is not inbuilt with IMA. One needs to pay extra premium year on year to get the indemnity coverage. They have since then updated the Foreign Currency Mark Up Fees. While writing the review it was indeed 1.99%. Now I saw it has been changed. I have updated the article accordingly. I currently work in a central govt medical institute and we have a SBI branch on campus that is the primary salary account branch for almost all the employees of the establishment. Obviously they are aggressively marketing this card to each and every one on campus, i already hold SBI prime so passed on it but it was funny to see the representative try to sell this to my friend who had shown interest in Prime. The representative actually said that prime has been discontinued, then following day he appeared again with a brochure with something called Prime Pro, which had yearly fees of 2000, reduced benefits and absent 10x categories of the prime variant, is this a devalued version of prime that they are looking to introduce?, would make little sense after launching a well designed product like prime. It might due to the fact that this Visa BIN (Bank Identification Number), the first 6 digits of the card number is newly issued to Indian region. In this case, it might take some time for the payment gateways to get trained/modify card BIN data. If might be inconvenient but nothing can be done from our end or at least try contacting the respective payment gateway and inform them that it the card is issued in India, and they may require scanned copy of the front side of the card revealing the first 6 digits of the card number and the rest along with the name and date of expiry masked. I still remember this happened when new variant of Visa debit card was issued by Axis bank and it was considered as credit card in some payment gateways. Hi..Can a BHMS doctor can apply for this card? You have to ask them. As far as I know, this card has been opened in collaborating with IMA, which represents MBBS doctors. I have applied for the card one month back, i got verification call ,they told i will get card in 14 working days but still i hv not recieved card. The agent who has sumbitted my application says it is under progress. What should i do. When I contacted the AGENT, he told me that it is being issued only to DOCTORS practising in few selected cities only.I don’t understand the logic behind this preferential treatment.One should ascertain whether he is aDOCTOR or NOT and his financial status.Why this strange ELIGIBILITY requirement? 1. Does this Doctors Card serve other purposes of a normal Credit Card too? Like paying bills at a bar, online shopping etx? Or is it just for the purposes enlisted in the brochure? 2. What is the upper limit of using this card all at one go? It is just like a normal credit card. What do you mean by upper limit of using the card all at one go? If you are asking about Credit Limit, it will be the decision of the bank based on your risk and financial profile. How to acess the priority pass?